Easter dinner is pretty standard around here. 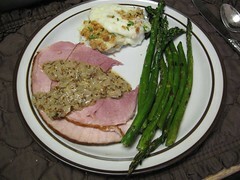 There will always be baked ham, mashed potatoes & gravy and deviled eggs from leftover Easter eggs. As for the rest of the meal, I plan a few different options, then wait to see what I get on sale over the next few weeks before making my final selections. We’ll either have green beans or creamed peas. Corn or mac & cheese. The veggie tray will be filled based on what fresh foods I find in the days leading up to Easter. And, dessert? Well, I’ll have a hard time sticking to just one. Carrot cake or strawberry pie are the current front runners. This year, it looks like we’re heading to my parents for Easter, since we’ll be celebrating my nephew’s birthday the same weekend. That makes my job a lot easier, because the extended family always has a pitch-in. I’ll be helping Mom with the ham, eggs & potatoes. Then, I’m just responsible for my own contribution so I can definitely go with the sales, or things I’ve already stockpiled, on a quick dish or two. What’s on your plate for Easter this year? Included recipes & searches are linked via Foodily. I was selected to be a Foodily Brand Ambassador by Clever Girls Collective, which endorses Blog With Integrity. This is a compensated program, but all of the opinions I share are my own.